Watch only mode on the Gear S3 and Gear Sport can extend battery life by 40 days! The Gear S3 got a major update today in the form of the Value Pack update, which bumps the software on the watch to Tizen 3.0 and brings it on par with the Gear Sport (read our review here). There’s a lot of new stuff on Tizen 3.0, including a Watch only mode that disables all functionality and makes the smartwatch act as a regular watch that shows the time and nothing else. 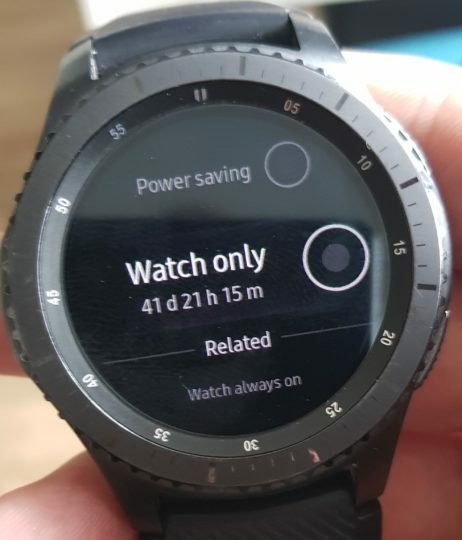 It’s like an ultra version of the ultra power saving mode found on Samsung phones, and on the Gear S3, it can extend battery life up to more than a whopping 40 days ! The watch only mode is rather problematic when it comes to the implementation. When the mode is enabled, the watch won’t continuously show you the time; instead, you will need to use the power button to see the time, a few seconds after which the display goes blank until you press the power button again. Not a great implementation, not for a feature that is supposed to turn your smartwatch into a regular watch. Even with the “watch always-on” option enabled, the display will stay blank until you press the power button in watch only mode. There’s also the fact that not many smartwatch users will find themselves without a charger for so many days, but we have to say the watch only feature will come in very handy when you’re looking to save your Gear S3 or Gear Sport’s battery. Naturally, the Gear Sport won’t be able to go up to 40 days thanks to the smaller battery (300 mAh vs 380 mAh on the Gear S3), but it should still last longer than anyone would need on a single charge. We just hope Samsung will add an option to permanently show the time in watch mode, unless it’s a tough thing to implement when all the other smartwatch functionality is disabled. How do I enable watch only mode? To enable Watch only mode, access the watch’s settings, go into the Battery management menu, then tap the Watch only option. The watch will restart to go into watch only mode, and you can get back to regular functionality by keeping the power button pressed for three seconds.